IABC Canada West shapes the credibility and future of the communication profession in Western Canada through the words and actions of volunteer leaders. The region is run by an eight-member volunteer Board of Directors and representatives from each of the six chapters (British Columbia, Calgary, Edmonton, Manitoba, Regina, Saskatoon) in our region. Our focus is the leaders who manage the operations of our chapters. Just Announced! Date to Lead Registration Now Open! Dare to Lead is our annual Western Canada chapter leadership conference. This year, Dare to Lead is heading to Edmonton, and registration is now open! Mark your calendars for May 24-26, and click here for more information. Conferences are coming to Western Canada! 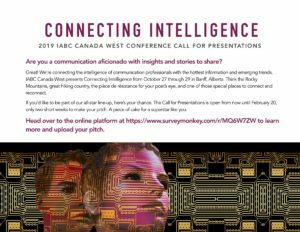 The IABC Canada West Conference in Banff, Alberta on October 27-29, 2019. Make sure you save the dates and we look forward to seeing you there! Thanks to @sfuCMNS co-op for sponsoring! Did you know: IABC members get exclusive access to new postings in the IABC Job Centre? The IABC Job Centre is the definitive career resource for the communication profession, serving job seekers & employers in all industries. Post a job or a résumé today. Make sure to purchase your tickets for @IABCyyc’s annual conference Transform: Understanding! Early bird prices end tomorrow! To find out more and register, visit https://t.co/faS0Gau7vp.